Chiropractor Fort Collins: Do You Need To See Your Local Chiropractor? It isn’t uncommon for people to wait until they are seriously injured to see a local chiropractor. Whether it be a slip and fall or a car wreck that has resulted in them walking into our office at Revelation Chiropractic, we are here to help. However, something that many people do not realize is that there are plenty of other signs that you need to see a chiropractor besides being injured. 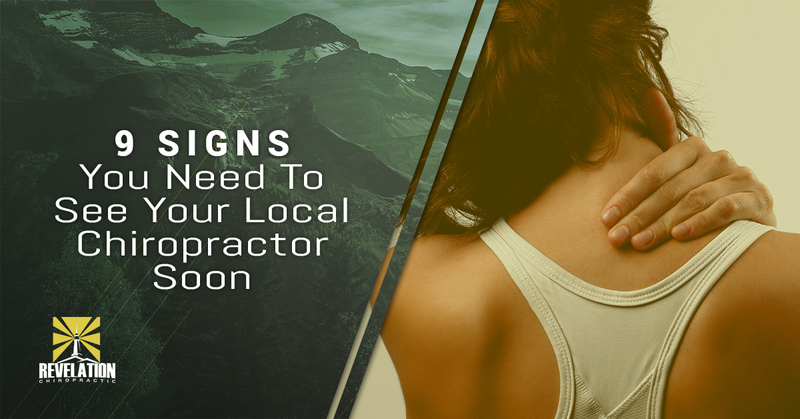 If you want to know more about what sorts of signs you should be looking for that will signify it’s time for you to pay a visit to the chiropractor, keep reading below. There are a number of reasons people get headaches. The most common causes, however, are dehydration, malnutrition, oxygen deprivation, and having a spine or neck misalignment. When you are having headaches frequently, it’s a good idea to see a chiropractor. An adjustment might be just what you need to improve blood flow and relieve you from the symptoms of your headaches. It is possible that your chiropractor will also suggest a change in your diet to assist in improving your overall health. When people have aches and pains, the first thing they often do is head for their medicine cabinet and grab the aspirin. What they likely do not know is that muscle and joint pain can be caused by a musculoskeletal alignment. Your local chiropractor knows precisely how to get you the relief you need by using the proper spinal manipulations that will take the pain away. When these manipulations are completed, you will experience increased blood flow and nerve conductivity in the areas that were experiencing the pain. If you have a job that requires you to sit for extended periods of time, it is completely normal that your posture would suffer. After being hunched over a keyboard all day long, your posture is likely putting a lot of strain on your neck, shoulders, and upper back. This added pressure is known to cause a number of problems, with the most serious being a slipped or herniated disc. Clearly, a very obvious sign that you are in need of a chiropractic adjustment is experiencing chronic back pain. While there are many things that can contribute to a person having chronic back pain, your chiropractor will do everything possible to relieve your pain so that you do not have to opt for invasive surgeries or narcotics. This may seem like a weird sign that you need to see a chiropractor but if you are wearing the soles of your shoes out differently, this is a good indication that your spine is misaligned. Having soles that are worn down differently tells your chiropractor that you are likely experiencing a subluxation in your spine. If you find that you are now less flexible than you once were, this is a good sign that seeing a chiropractor is a reasonable next step. Whether it is your arms, legs, or your neck that don’t seem to have the same range of motion that they used to, a chiropractor can likely help you to get back to your normal level of flexibility. If you are an active person and you spend a good amount of time exercising or playing sports, you are putting a good amount of pressure and strain on your spine. This can and often does lead to a misalignment. You are also more likely to deal with the aftermath of your athleticism in other ways as well. You could end up with a pinched nerve or a slipped disc if you aren’t careful. This is why we would recommend that you see a chiropractor often if you are a relatively active person. If you find that you are experiencing sharp or shooting pains, numbness, or tingling in your legs, this is an indicator that you are actually suffering from a slipped disc or a pinched nerve. This will require that you see your chiropractor and have an adjustment so that the pressure can be relieved and you will no longer experience the symptoms you have been dealing with. We all want to be healthier in a manner of speaking. Seeing a chiropractor regularly is one of the best ways you can do this without having to put in hardly any effort at all. If you are experiencing any of the symptoms above or you simply want to be healthier as a whole, we would suggest that you contact our office today. Not only can we recommend a treatment plan for you, but we will also help you to understand what you can do in your free time to prevent your symptoms as well. Call us right now to learn more about the services we offer.